Iguana-Rid, LLC is a privately held company located in Pompano Beach, Florida. It was started in 2009 by Mark Streisfeld and Michael Pikman. Iguana-Rid, the product, was developed in the beginning of 2009 by Mark Streisfeld in response to the need for a deterrent that would work on non-native iguana’s in South Florida. Months of research and development as well as extensive testing finally produced a unique and viable product. Iguana-Rid, LLC was formed, start up capital was acquired, and production commenced. All aspects of product licensing, packaging, labeling, insurance, and logistics were accomplished. The product was introduced to the market place in June, 2009 and placement was made in several retail outlets. Being the first and only product of its kind, this eco-friendly, organic iguana-deterrent and organic pesticide took off at a rapid pace. Due to its uniqueness, media coverage in South Florida caused sales to increase rapidly. 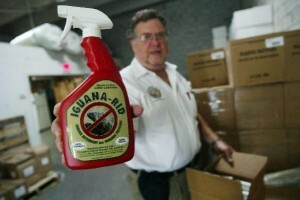 It was found that the Iguana-Rid formula is effective in deterring many additional animal pests. Some of them include: snakes, frogs, bufo toads .curly-tail and other lizards, squirrels, rabbits, ducks, geese, deer, raccoons, skunks, and many more. The bio-pesticide activity impacts hundreds of bug species some of which are: mealy bugs, beetles, white flies, leaf chewers, thrips, aphids, spider mites, snails, etc. The success in deterring so many varied animal pests prompted the creation of the new label, which would allow sales throughout the U.S. and other countries. Pest-Rid, the Organic Animal Pest Chaser, a registered, patent pending product is now available for distribution. In addition to the liquid spray product, a granular form has been produced. Pest-Rid Golden Granules is a great addition to the product line. In early 2012, seeing a growing problem both in the U.S. and worldwide, Bed-Bug-Rid was launched as natural and effective solution to both treat and prevent bed bug infestations. Supported by multiple independent laboratory tests, Bed-Bug-Rid has been featured on QVC and currently being placed in numerous retail locations around the country. Iguana-Rid, LLC is selling product on many internet sites, such as Amazon.com, Homedepot.com, Staples.com; Sears.com, etc. We sell to distributors all throughout the Caribbean and as far away as India. Iguana-Rid, LLC recently moved to a larger office and warehouse in June, 2014. We have new products being manufactured and will launch early this year. Jungle Flora Paks, an organic growth accelerator for everything that grows and Happy Shine, a one step cleaner-polish that resists dust and dirt, are being marketed in several ways. I will never travel without it..
“What a great product. It is so frightening to be exposed to Bed Bugs and feel so extremely vulnerable. I thought living in a big city was the problem. Then I learned that anywhere can be a problem. Our urban bugs were transported by a moving van to the country. Bed Bug Rid is a wonderful antidote. It is natural, smells like cinnamon, easy to buy and better yet apply and it WORKS. Be safe and prepared.. Recommend highly to all of my friends and family. Will sleep peacefully knowing there will be no bedbugs visiting me at night. “I was going on a trip, so fearful of bedbugs at the airport, hotel, and then bringing them home. Purchased Bed Bug Rid, the 3 oz travel size was great to take, and the other sizes to be used when I got home.